For further details please see section [options] and [setup]. where disk.img is an existing image file (created e.g. via qemu-img create disk.img 3G), grml.iso is an a Grml ISO (http://grml.org/), /mnt/point/of/iso/ refers to the mount point where the specified Grml ISO is mounted to (e.g. mount -o loop grml-medium_sid_latest.iso /mnt/test) and kvm_arguments are optional and can be used to add additional arguments to the KVM commandline, like vga=791. The </mnt/point/of/iso/> doesn’t necessarily need to be a real mountpoint. It’s fine if you just copy linux26 and initrd.gz from /boot/* of the Grml ISO to </path/to/foobar/boot/> and specify </path/to/foobar/> as mountpoint directory then. where disk.img is an existing image file (created e.g. via qemu-img create disk.img 3G), name assigns the virtual instance a name (for reading /etc/kantan/name.cfg iff the file exists). The kvm_arguments are optional and can be used to add additional arguments to the KVM commandline, like -boot d for booting from the ISO. 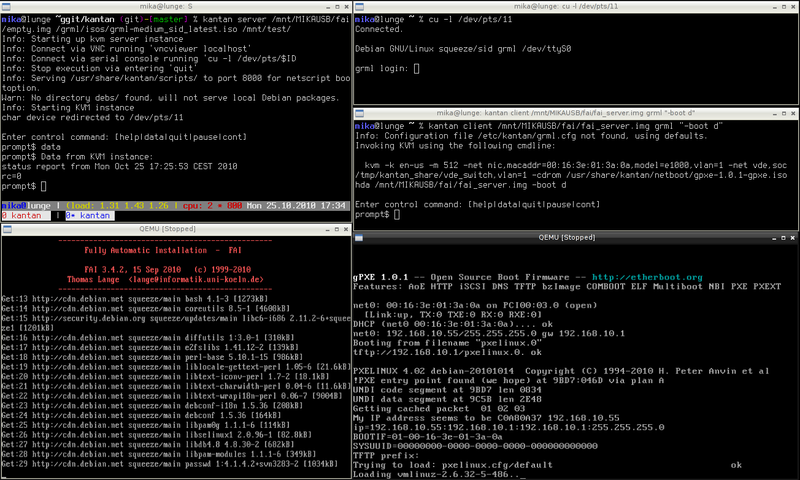 Kantan is a set of scripts to automatically test software using KVM (http://www.linux-kvm.org/) and the Debian based Linux live system Grml (http://grml.org/). You don’t have to set up neither tons of software packages nor a complex environment but just follow some simple setup instructions. It was originally developed to provide a simple way for autotesting specific versions of FAI (http://fai-project.org/) but is expected to provide a simple-to-use test suite for autotesting any Linux based software. The concept of Kantan is to boot one virtual machine (the main instance, kantan server …) which is supposed to be able to serve as installation server for further virtual machines if needed. This concept for example allows to automatically set up a FAI server which then deploys further started virtual machines (the clients, kantan client …). This software is WIP, though released in an early stage to gain feedback, testers and developers. It’s a prototype implementation mainly in shellscript but is expected to be rewritten in a real scripting language like python. If necessary adjust /etc/kantan/server.cfg according to your needs. % kantan client fai-client.img grml "-boot d"
That’s it! :) Further usage scenarious and tests will follow. The author of Kantan thinks that lack of proper Q/A is one of the most annoying issues in the open source world. So let’s do something against that. 7.2. What does Kantan mean? The author of Kantan is a friend of the Kanban concept and created the word Kantan based on "the Kanban of testing". Amusingly according to http://www.cjvlang.com/Writing/writjpn/signs/kantan.html "Kantan is a Chinese-style compound (on-reading) meaning simple." which represents the idea of Kantan: provide a simple method for testing software. 7.3. Why use a VM and not just a chroot? Chroots provide a nice way for testing stuff like package installations. But they are limited to some restricted actions. Chroots don’t properly support testing kernel versions, bootoptions, partitioning tools, LVM, mdadm,… in a reasonable environment. 7.4. How can I use Kantan with physical machines? By default Kantan uses vde_switch for network configuration. This provides a working network setup between the server and the client(s) machines without having to configure anything. But if you want to use external, physical machines this does not work any longer. Instead just set up tap devices so you can install clients on real[tm] hardware. Assume the following setup: the Kantan server is the server where you’re executing "kantan server …". The test client is the machine where you want to boot the system which would be corresponding to "kantan client …" (but instead of executing "kantan client …" as virtual guest you’re running it on physical machine). NIC eth0 is providing internet access (WAN). NIC eth1 is the network link between the server and the client machine. use kvm’s monitor support for sharing/controlling data? Probably. We just need a test suite for Kantan for testing.